Posted on Mar 18, 2013 by Appleton Downtown Inc.
Did you know about this Fox River dining option? Have you heard about the trendy, new gathering place with amazing views of the Fox River and award-winning cuisine? Many locals are just discovering this hidden gem, with a resort-like atmosphere, beautiful open spaces, high ceilings, and natural stone, right in the heart of Downtown Appleton! This four-story, eco-friendly building features three different dining venues while embracing the beauty of the surrounding Fox River with several outdoor decks, patios and trails. 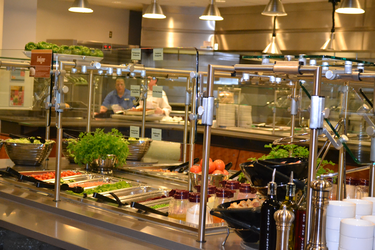 The Warch Campus Center has been serving breakfast, lunch and dinner since 2009. Here is the kicker...it is not just for the students and faculty at Lawrence University! All three dining/food venues are open to the public year-round. Bon Appetit Management Company operates the food service, which prides itself on fresh, made-from-scratch offerings. Its main dining room, Andrew Commons, also known as "The Commons," features several different buffet-style food stations, including a 24-hour breakfast bar. Items like Ginger Plum Chicken or Tofu Stir Fry can be found on the menu, along with many gourmet-style dishes, vegetarian and even gluten-free options. Their Farm-to-Fork philosophy means that they purchase from local small farmers and the student operated garden, (SLUG) Sustainable Lawrence University Garden, who use sustainable farming practices. 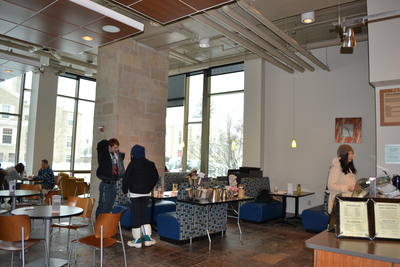 The Commons provides stunning views of the Fox River and even offers outside seating during warmer months. 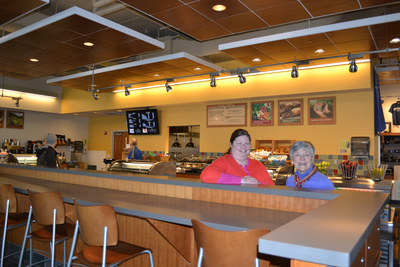 Another popular dining venue within the Warch Campus Center is the Kaplan's Grill/Bob & Pat's Coffee Central, affectionately known as "The Grill." This cozy cafe offers everything from soup and sandwiches to gourmet coffee and ice cream. Live music is featured every Monday evening inside the popular cafe. Last, but not least, is Kate's Corner Store, sometimes called the "C" store by the regulars. Pre-made sandwiches and wraps can be found here, along with convenience items and grocery staples in small quantities. A fan-favorite is the gigantic display of bulk candy to satisfy sweet cravings. A popular draw has been the Saturday and Sunday brunch at 10:30 a.m., according to Julie Severance, general manager of Bon Appetit. The Warch Center Somerset Room also accommodates up to 320 guests, which is making it a popular location for weddings. "Some people say we have the best views of the Fox River from our dining areas," said Severance. Bon Appetit employs about 240 people, and 150 of them are Lawrence students. In addition to staffing the three dining venues, the management group caters many community events. "Approximately 60% of our catered events are third-party events like weddings, banquets and charity events," said Severance. Director of Conferences and Special Projects Lynn Hagee helped lead the Campus Center task force during the building process and she continues to seek ways to make the building more efficient for students and visitors. "The building received the Gold Level of LEED certification by the U.S. Green Building Council. We take sustainability very seriously and we tried to incorporate that into the building and its services," said Hagee. "We continue to ask the students for feedback so we can meet their needs and operate as efficiently as possible," she said. It is best to park in Downtown Appleton or on a nearby side street and enter the Warch Campus Center at 711 E. Boldt Way. Hours vary throughout the year, so be sure to check the website for current dining schedules. To inquire about scheduling an event or banquet, contact Matthew Baumler, 920.832.6839 or matthew.k.baumler@lawrence.edu.